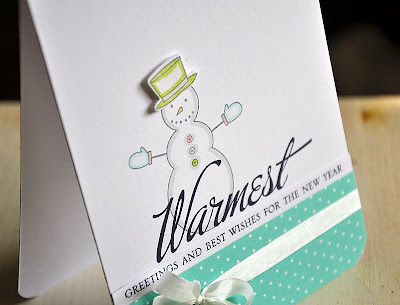 Dies have proven to be such versatile and trendy tools, and so... they have become a necessity in many card makers collections, making them a "hot item". 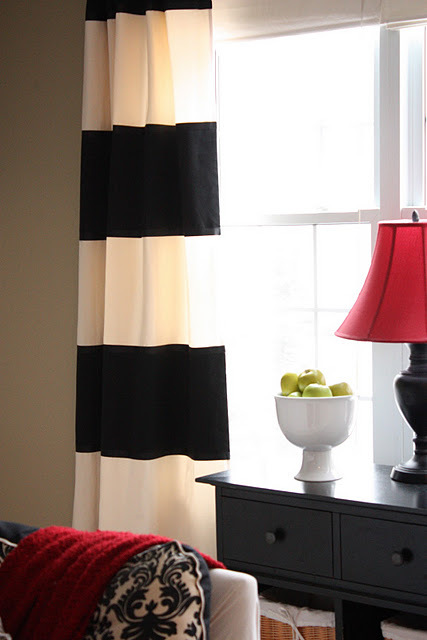 Another currently trendy style, this year, has been the color blocked look. You can find this trend not only in the world of card making, but in the worlds of fashion and home decor. When you combine the two you get a trendy and unique look that's an easy addition to your own creations. 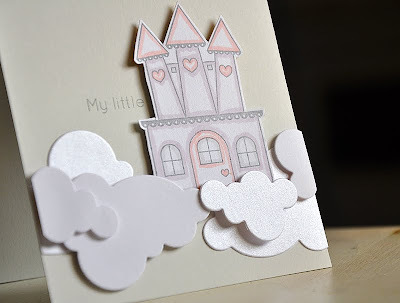 Using the same techniques available to you through your dies, you can take them up another notch by die cutting color blocked shapes, focal points, borders, panels and so much more. First up, a colorful color blocked Christmas tree to make the perfect thank you card for after the Christmas holiday. I started this card by trimming and stamping a white cardstock panel with a sentiment from In The Meadow, in True Black ink. Then attached the panel to a Soft Stone card base. 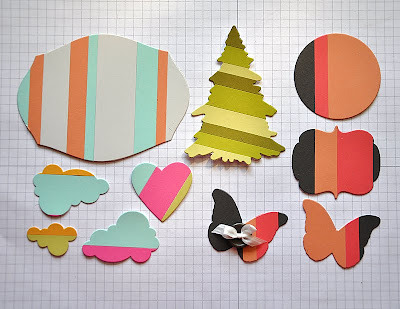 I then die cut the Christmas tree from cardstock colors of Aqua Mist, Summer Sunrise, Spring Moss & Hibiscus Burst. 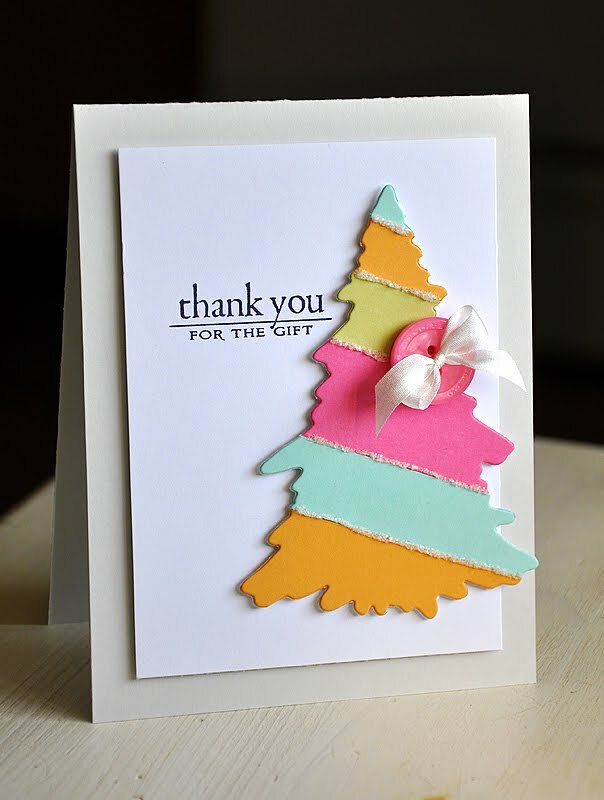 Attached the tree to the card base, touched up with glitter and embellished with a button and a ribbon bow. Let me show you how: Start with an assortment of colored cardstock strips cut to different widths. 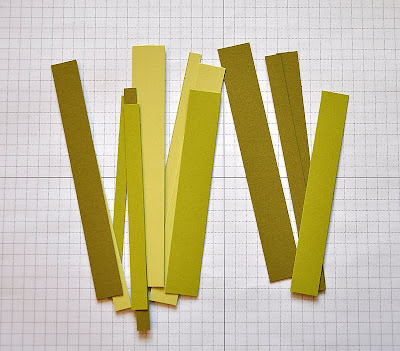 Then attach the strips to a cardstock panel and trim the edges. Now you are left with a color blocked panel ready to be put to work. Here's A Tip: Be sure to give the back of each strip a good covering of adhesive. Try to cover the entire piece. Here's A Tip: When die cutting through two layers of cardstock, you may need to make a few passed through your die cutting machine to ensure a clean cut. Another option (if you can't get your machine to cut through the two cardstock layers) would be to attach the cardstock strips to a lighter weight cardstock or even to computer paper. 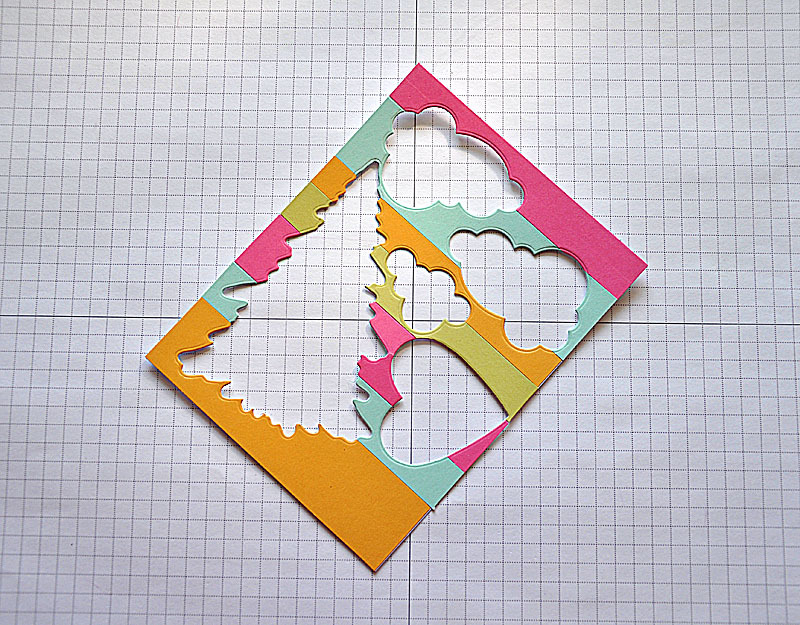 My die cutting machine has no problem cutting through two layers of cardstock. I started by creating a color blocked panel from cardstock colors of Smoky Shadow, Berry Sorbet and Melon Berry. 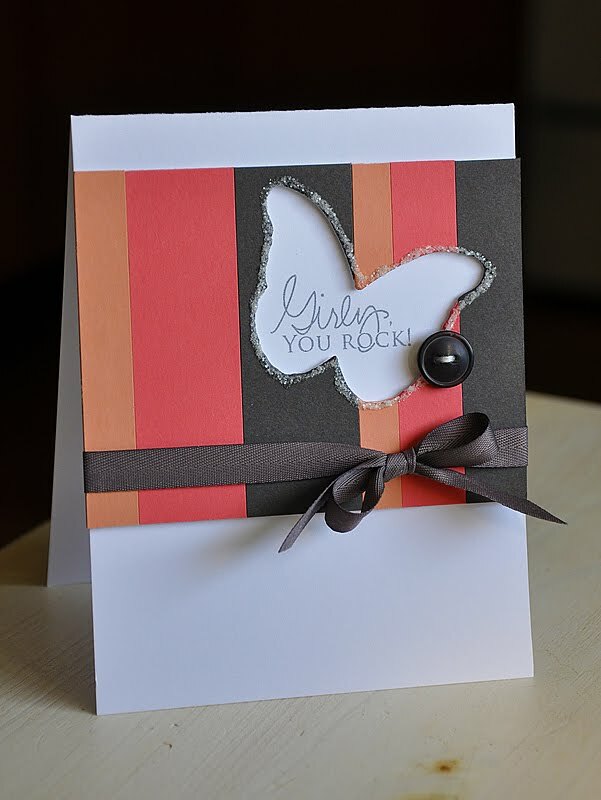 I die cut a Signature Series: Butterfly from the panel, wrapped it with Smoky Shadow Twill ribbon and attached it to a white card base using dimensional adhesive. Within the die cut opening, I stamped a Signature Greetings sentiment. 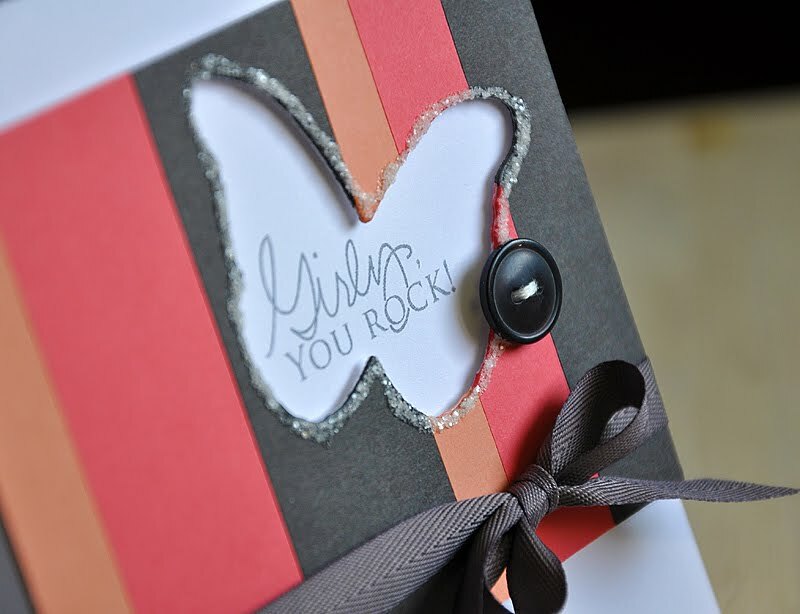 Then embellished with a Smoky Shadow button and glittered around the butterfly opening. I hope all of you have been inspired by what I've shared with you today. 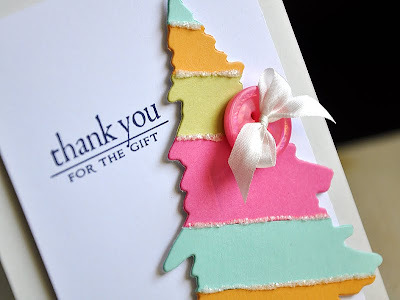 One things for sure... you'll be seeing more color blocking with dies from me in the future. If any of you decide to give it a try too, be sure to share your projects with me. I'd love to see! Merry Christmas to you all! I hope you have a blessed and wonderful one! Now, let me get started!... First up, Flower Fusion #11 and Happy Days. 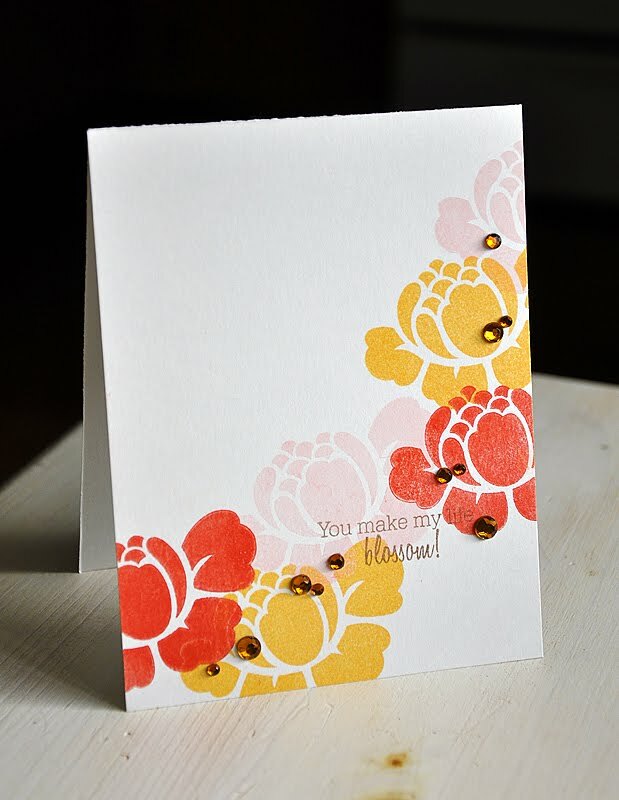 I stamped the Happy Days frame and the Flower Fusion flower and sentiment onto the card base. 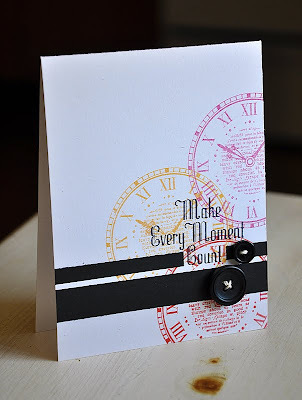 Die cut a strip of cardstock using the coordinating Happy Days frame die and adhered onto either side. 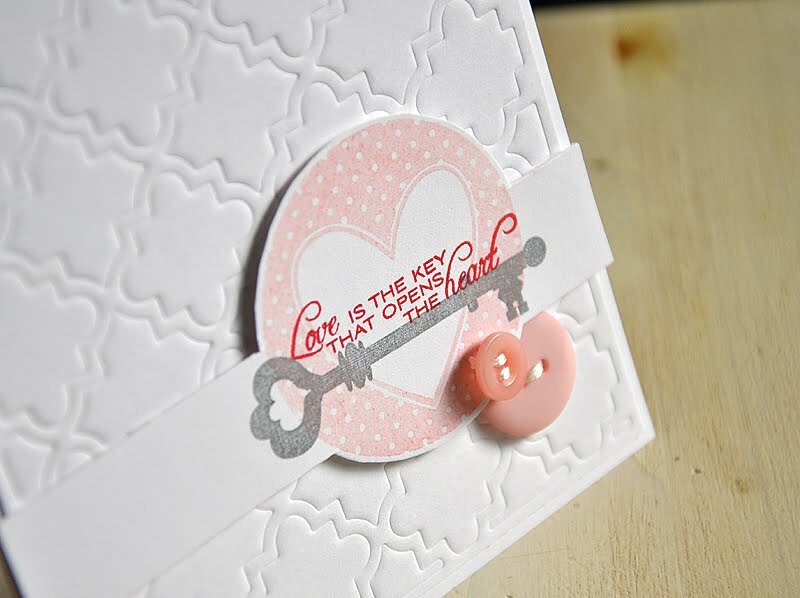 Next, Lock & Key and Tag-its #11. 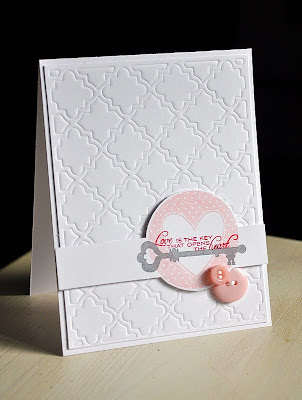 Here is another use for those fun Cover Plate: Quatrefoil dies, just run it through your die cutting machine as if it was an Impression Plate. So simple! I just love this little air plane from Tremendous Treats: Valentine! 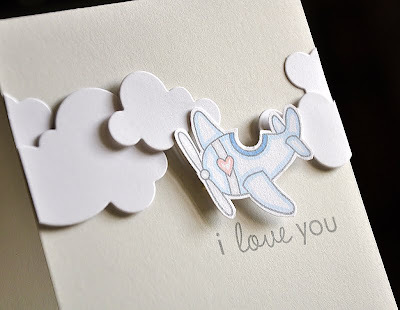 Stamped the plane in gray ink and outlined the image with a few Copic Markers. I'm not so good when it comes to coloring in images, but this is an easy alternative that really looks great. 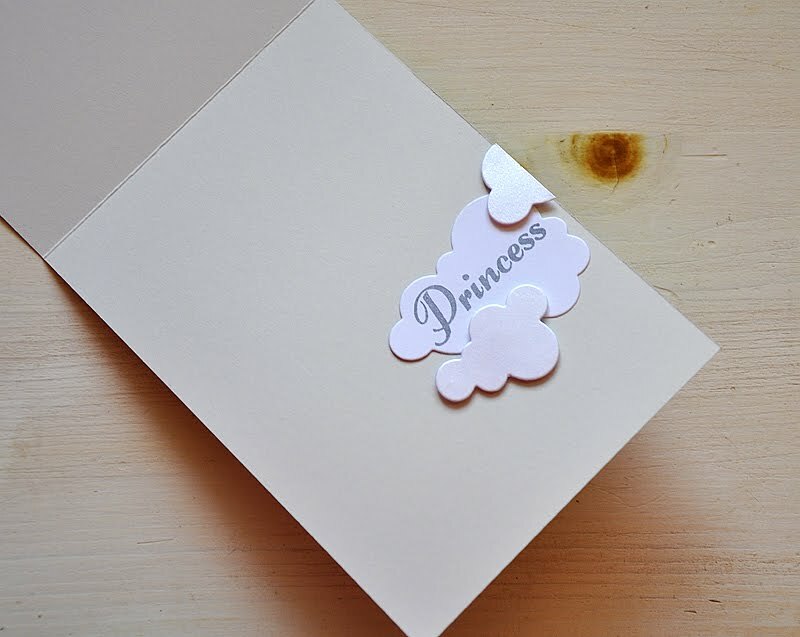 What little girl doesn't want her own princess castle (from Little Princess) floating in the clouds?! Again, I used the same coloring technique as above. Then perched the castle onto white and white shimmer die cut clouds. Love it! The rest of the sentiment is embellished in the inside of the card. Here's Made of Snow Mini. Yep, it's the same coloring technique as above again. 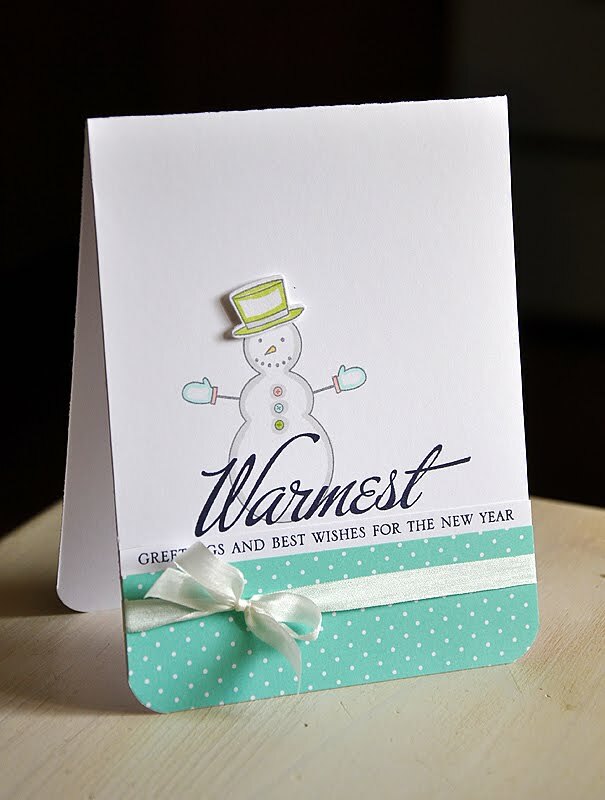 I combined this frosty friend with a heart warming sentiment from Big & Bold Holiday Wishes. 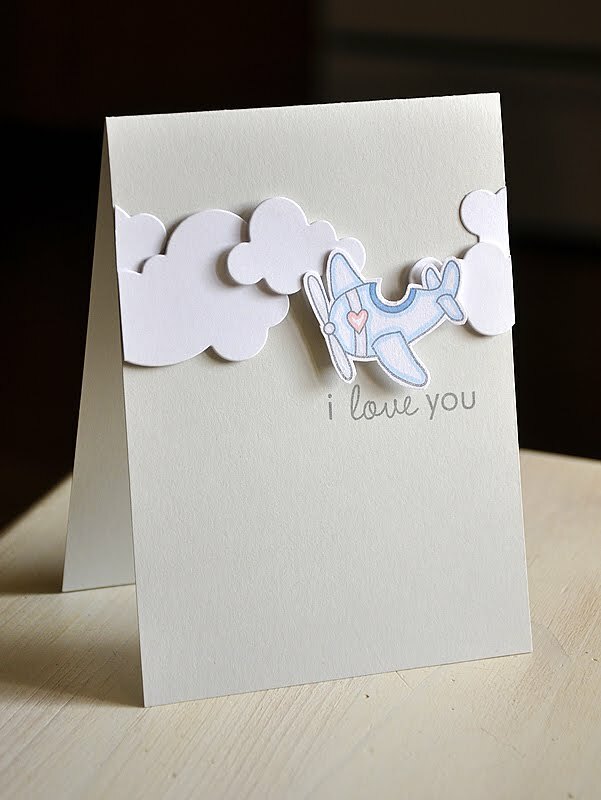 This little number features a sentiment from Tag-its #11. 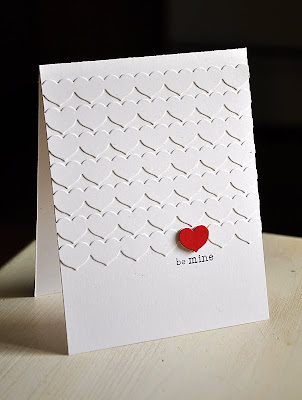 I whipped out my Heart Border Die to create this one. Last but not lease... Tree Tops and Think Big Favorites #11. 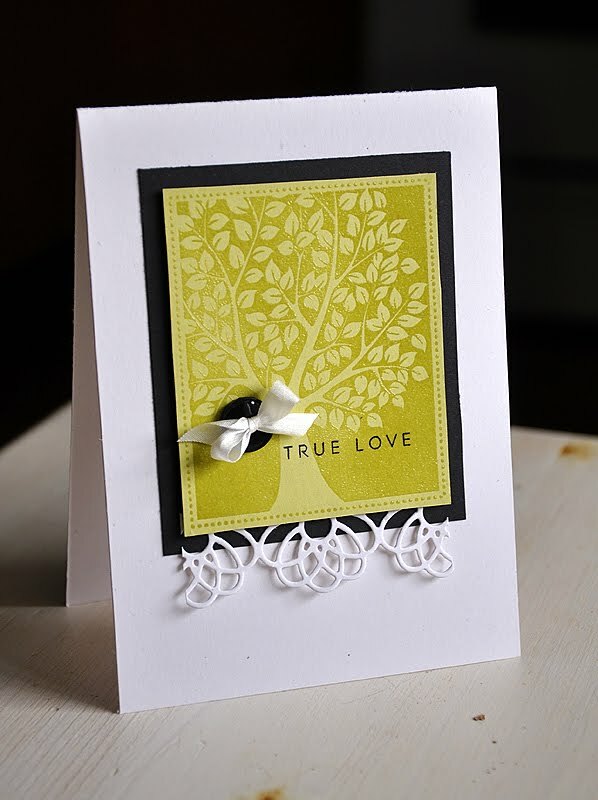 I perched a couple Love Birds into a clear embossed tree top. 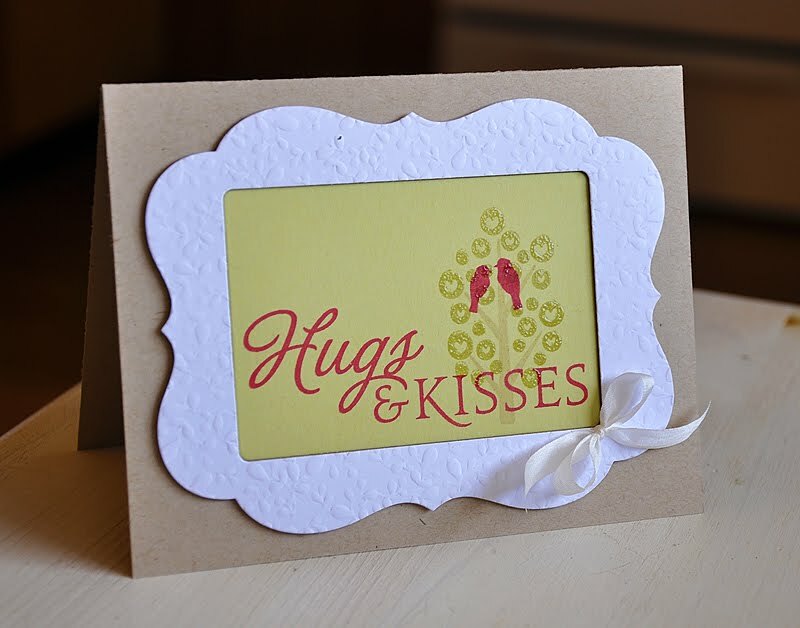 Framed the focal point with a die cut frame, which was created using the Mega Mat Stack #4 die, the rectangle die from the Button Card Collection and the Vineyard Impression Plate. 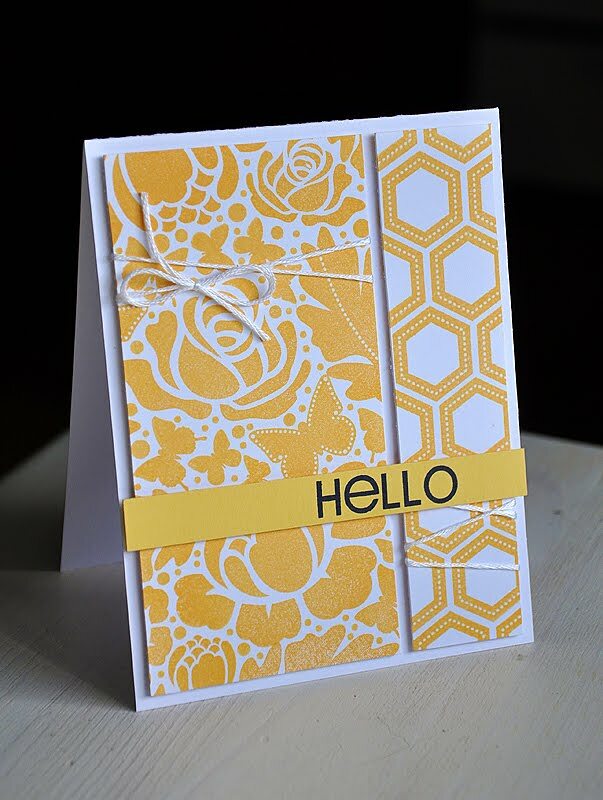 The final day of the Papertrey Ink Countdown is here and the Design Team has one final group post to share with you today. 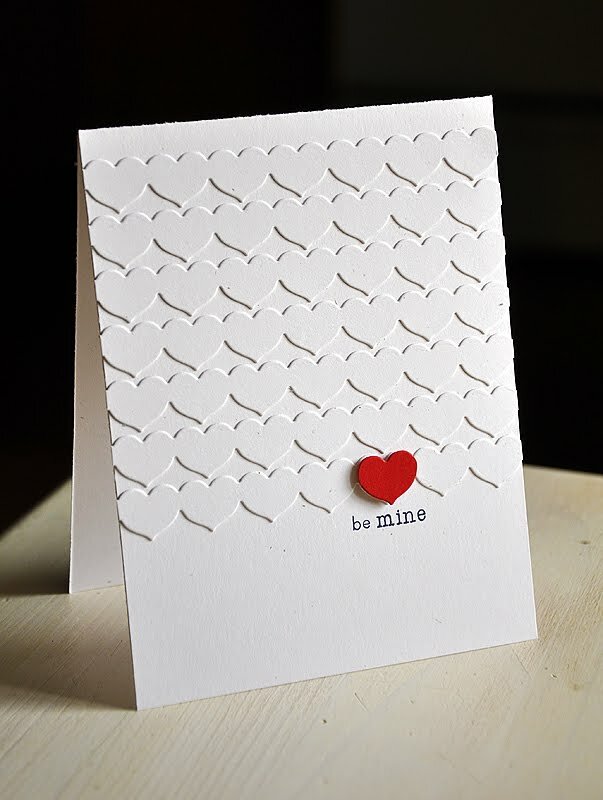 This time around we bring you a look at Love & Marriage, designed by Nichole Heady. 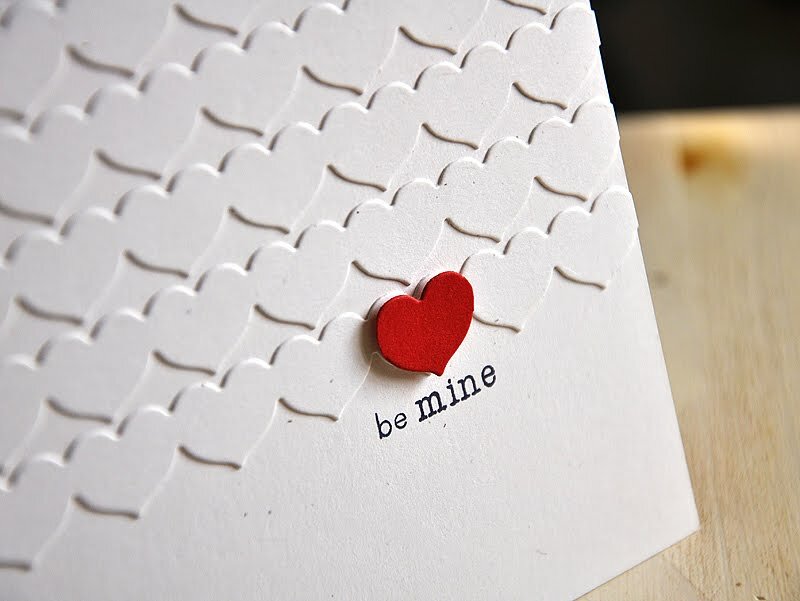 This set offers several different ways to express love to someone you care about, create projects for a couple you know and so much more. For today's project I've created a card perfect for an engagement and I chose to work with this lovely tree image. 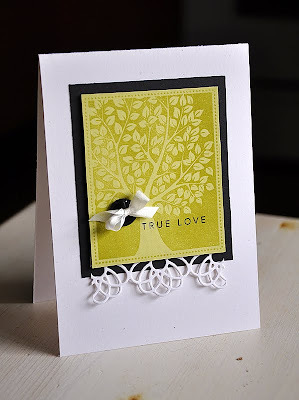 I started by stamping "True Love" in True Black onto Spring Moss cardstock. 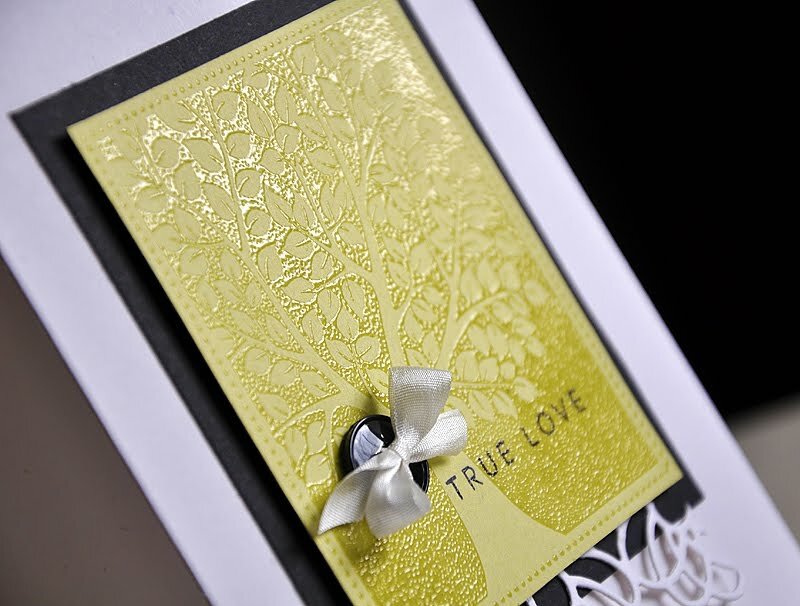 Over the sentiment I layered the tree in Versamark ink, embossed with clear embossing powder and trimmed. 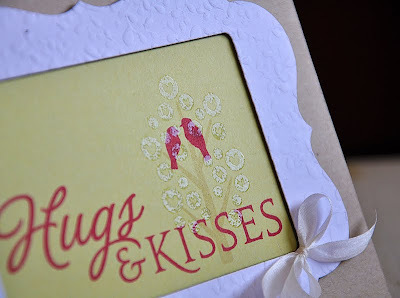 Embellished the bottom edges with a die cut Filigree Border, attached to a block of True Black cardstock (with dimensional adhesive) and then adhered to a Rustic White card base. 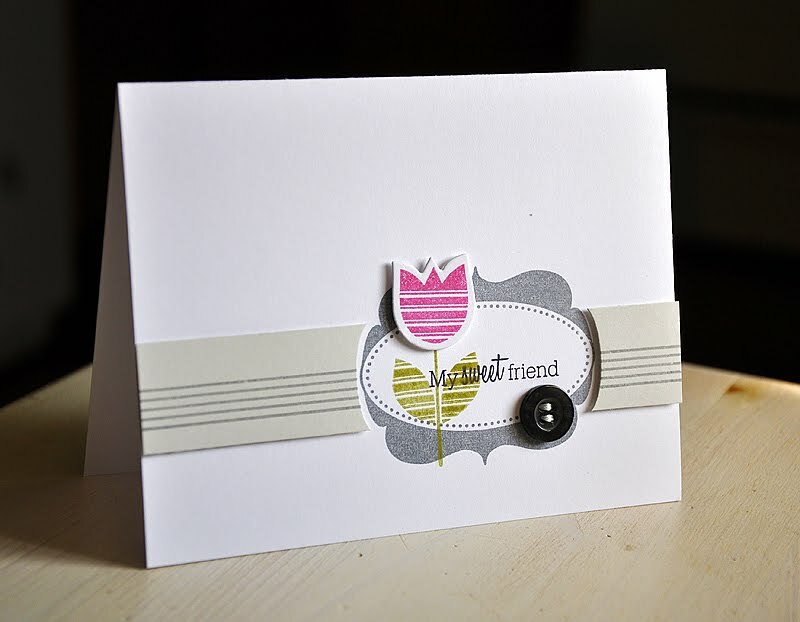 Finished the card of with a True Black button and a silk ribbon bow. For the inside I incorporated a little something special. 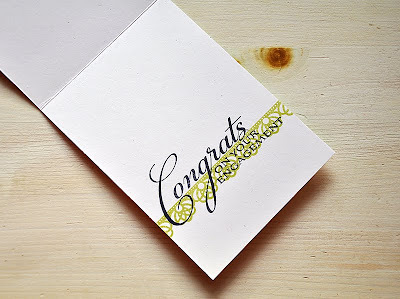 I stamped the Love & Marriage border in Spring Moss and then layered a message (from Congrats All Ways) in True Black ink. Hello everyone and welcome! It's day four of the Papertrey Ink Countdown, as well as group post day one. 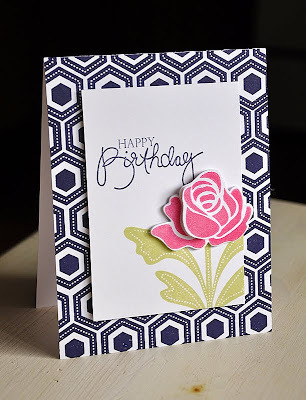 Our challenge this month was to find an inspiration photo and create cards featuring the new set Rosie Posie as both a focal point and a hand stamped background. I've got a bunch to share with you today, so let me get started... My first card was inspired by this gorgeous indoor living space (photo from here). I love the bold and clean color combo of black and white with a pop of color. Here's what I came up with... 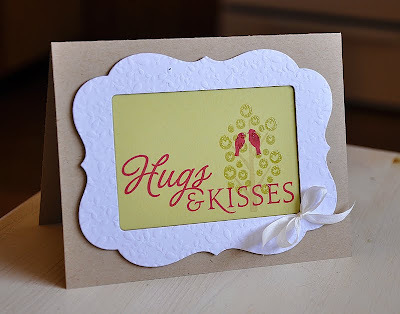 The boldly striped curtains and the damask pattern on the pillow lead to this hand stamped card base. I stamped it using two of the three background building strips included in Rosie Posie, in True Black ink onto a white card base. For a pop of color I stamped the flower stem in Spring Moss, just off of the edge of a white cardstock block. The sentiment used is from Birthday Bash Sentiments. For the flower... 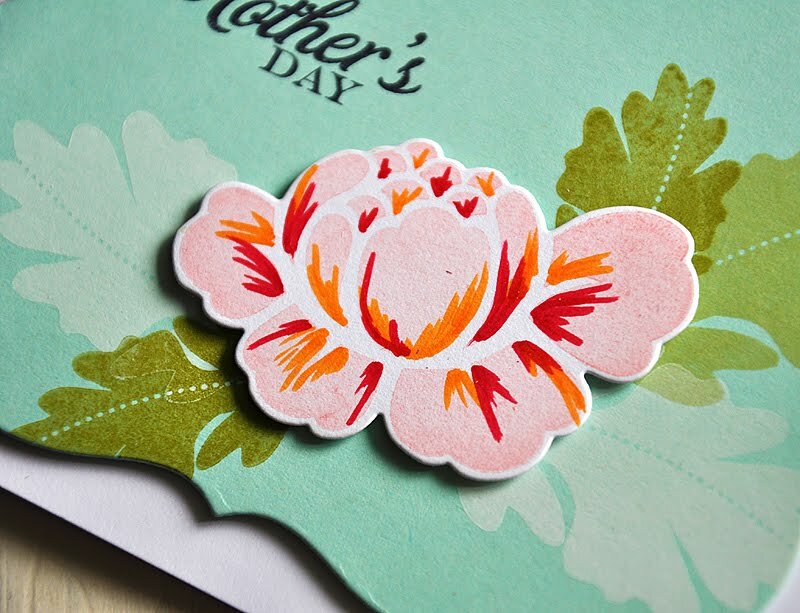 I die cut and stamped the base image; then stamped, trimmed and attached additional layers to give this gorgeous flower tons of dimension. 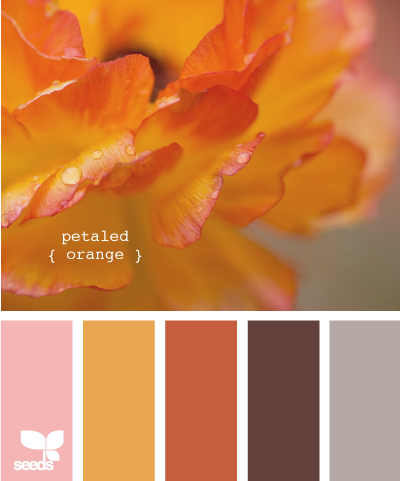 I fell in love with the colors of this next inspiration photo (photo from here). 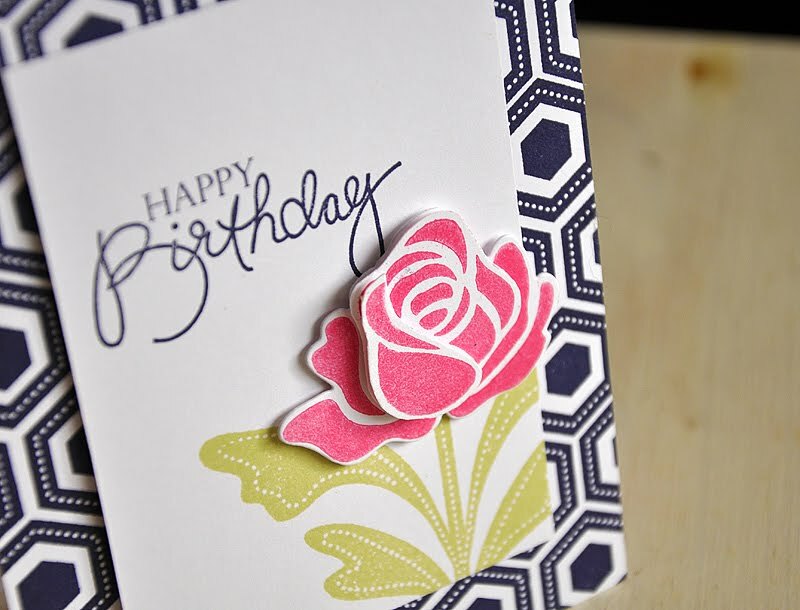 Here's what I came up with... And here's my single layer card for the day. 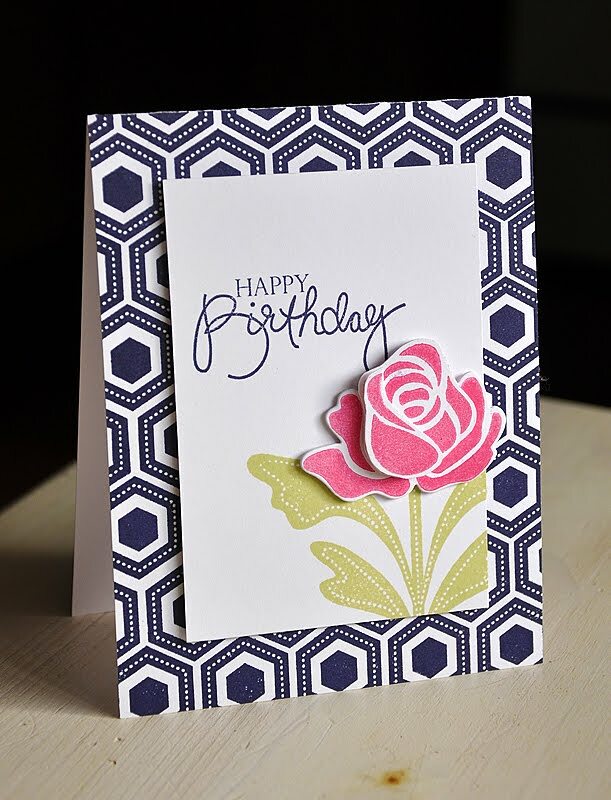 I started with a Soft Stone card base and stamped the large flower in a color combo of Summer Sunrise, Terracotta Tile and Sweet Blush. 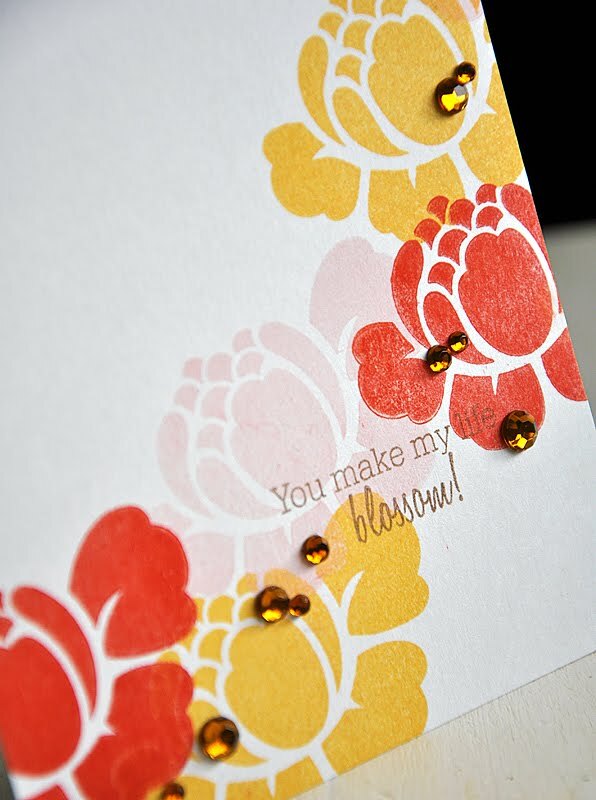 Added a sentiment (from the new Flower Fusion #11 set) stamped in Dark Chocolate and finished the card of with a scattering of brown rhinestones. 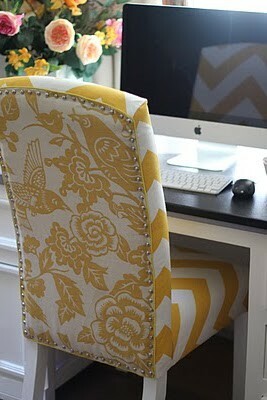 Check out this gorgeous chair, it makes for perfect inspiration! Here's how it all started... 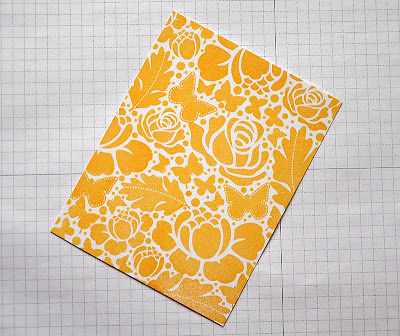 Drawing inspiration from the bird and flower pattern and the yummy yellow color of the chair, I hand stamped my own pattern paper. I chose to combine a few of the flower and leaf images from Rosie Posie with butterflies from Butterfly Dreams. The dots are from Rosie Posie (large) and Polka Dot Basics (medium and small). Here's How: I basically stamped this pattern by starting and building from one corner, arranging and fitting the images closely together (but without touching each other) like a puzzle. Then filled in any gaps with the three different sized dots (starting with the largest dot). 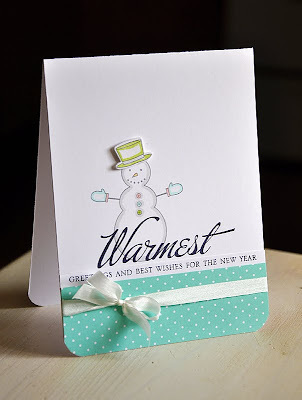 I stamped an additional pattern using one of the background patterns from Rosie Posie. Trimmed both pieces, wrapped with white embroidery floss and attached them to a white card base with dimensional adhesive. Finished it off with Harvest Gold sentiment strip (sentiment from Fillable Frames #1). My final inspiration is from Heather Bailey Online (here). I love the look of the colorful blossoms included in a lot of her fabrics. 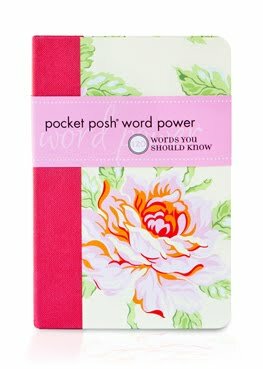 My hope for this last card was to incorporate that idea onto a paper flower in the same fashion. Here's what I came up with... 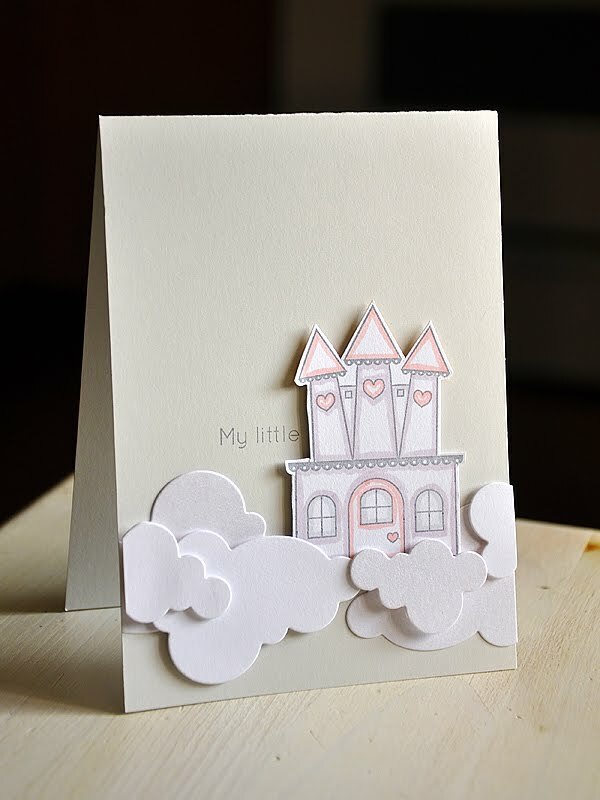 I started by die cutting a Mega Mat Stack #4 from Aqua Mist cardstock. It's a bit hard to see in the photo above (you can get a much better look in the photo below), but I stamped the Aqua Mist Mat Stack with different sized leaves using Fresh Snow, Spring Moss and Simply Chartreuse inks. Stamped a sentiment (from the new Happy Day set) and attached the panel to a white card base. Here's where I tried to achieve the look of a signature Heather Bailey flower... I die cut and stamped the flower in Sweet Blush ink. Then touched the flower up with an orange and red Copic maker (using very light strokes). I think I can use a few more practice runs before I achieve the look I'm going for. Anyways, you get the idea. Hello and welcome to the 2012 Hero Arts Catalog Blog Hop. 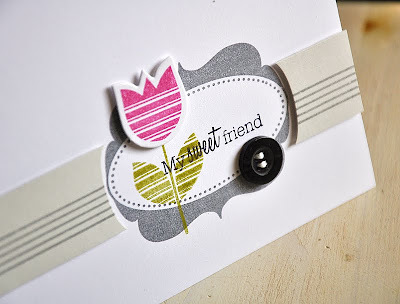 Today I'm joining friends in this blog hop to share previews of the new 2012 stamps. I've got a couple cards to share with you today, so let me get started... First up, I've used the large clock image from the new clear set, Special Time (CL579), stamped it in Raspberry Fizz, Summer Sunrise and Terracotta Tile onto a Rustic White card base. 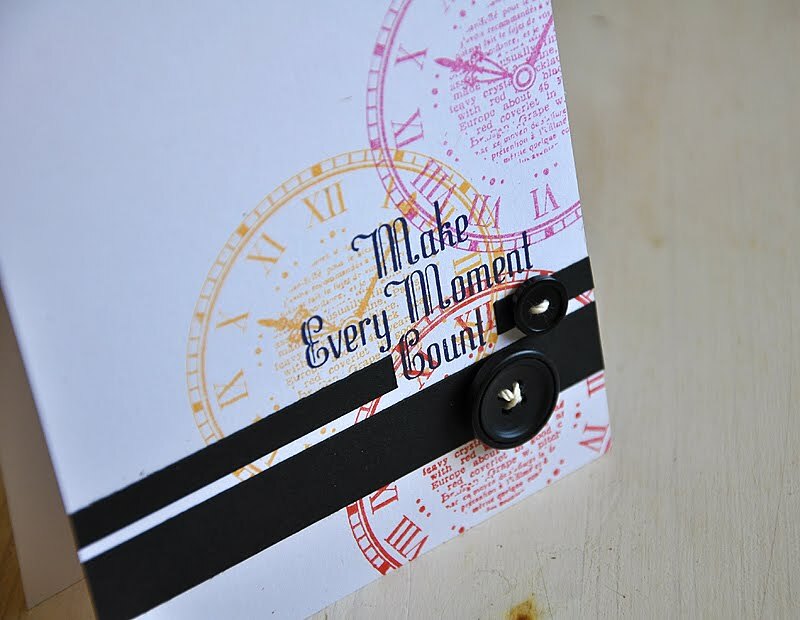 Finished the card off with a sentiment, from the same set, stamped in black. Attached a couple True Black cardstock strips and embellished with a couple buttons. 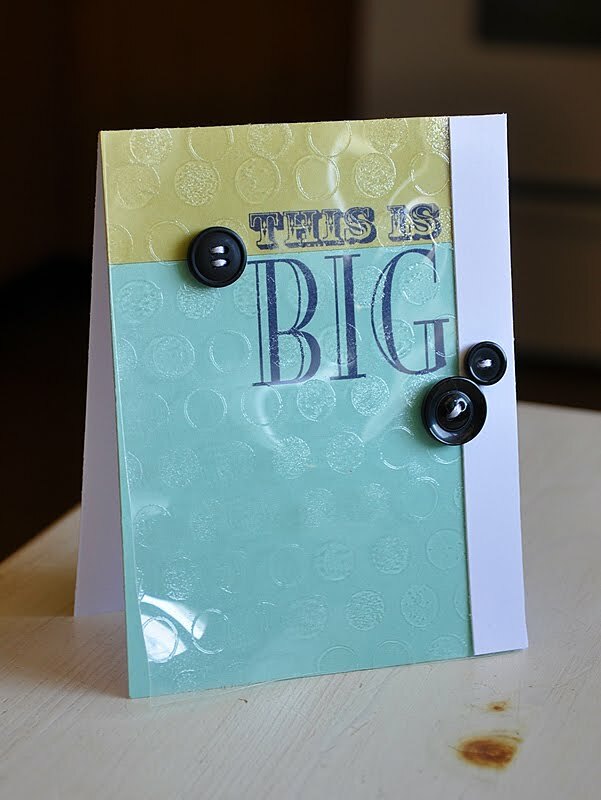 Next up is a fun new clear stamp sentiment set This is Big (CL570). I love clear and large sentiment stamps, they makes perfect placement a breeze. This was the key when crating this card, I wanted the chosen sentiment to stand on its own and to take center stage by stamping it onto different parts of this color blocked card front. 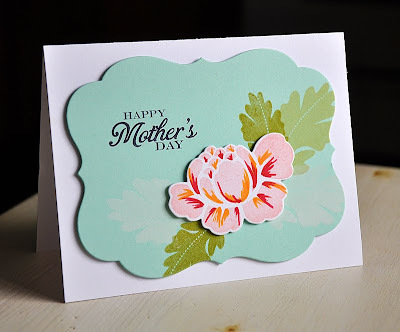 I carefully inked the top portion of the sentiment stamp and stamped it onto the edge of a Spring Moss card stock block. 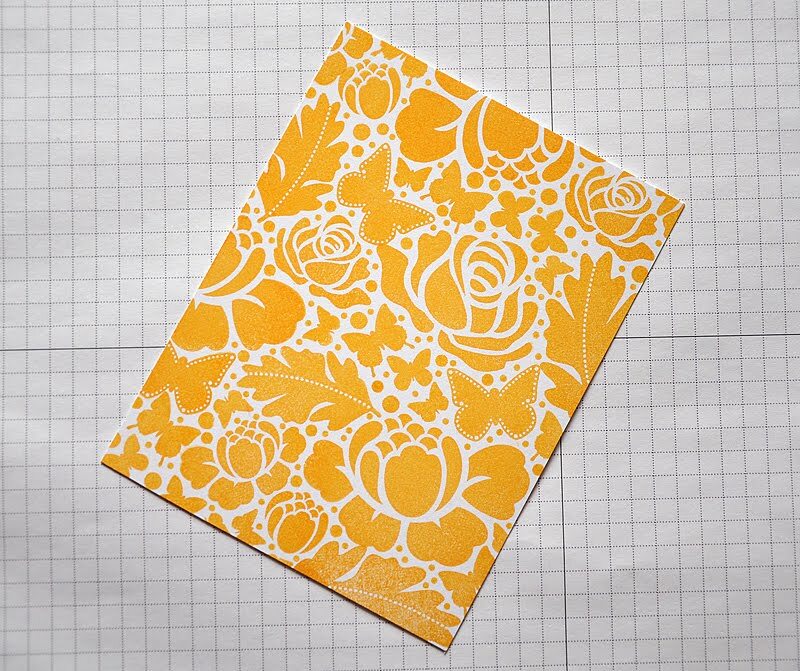 Then carefully inked the bottom portion and stamped it onto the edge of an Aqua Mist cardstock block. Both panels were then attached to a card base. For a bit of texture and detail, I heat embossed a clear cardstock panel with dots (from Life of the Party) in clear embossing powder. 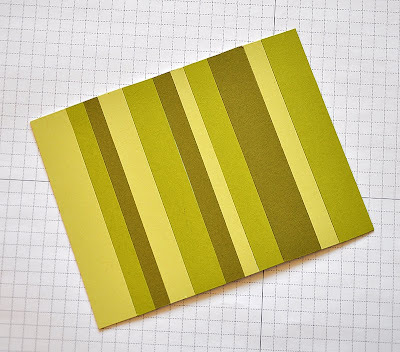 The clear cardstock warped a little in the process, but I liked the effect and went with it. To attach the clear cardstock to the card base... I first attached a white cardstock strip to the front of the clear cardstock panel. Then, to hide the adhesive, I attached another strip of adhesive behind the white cardstock strip and then adhered to the card base. Finished the card off with a few True Black buttons. Done with the cards, now how about a giveaway! 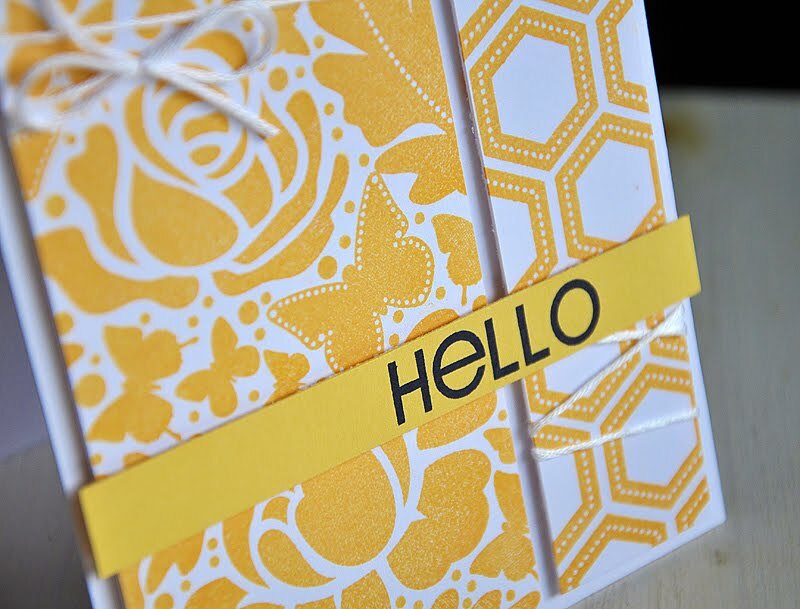 Hero Arts will be giving away 5 prize packages that include brand new 2012 Catalog stamps. The five winners will be randomly chose from ALL of the blog hop comments received by midnight PST on Monday, December 12, and will be announced on the Hero Arts blog shortly thereafter. 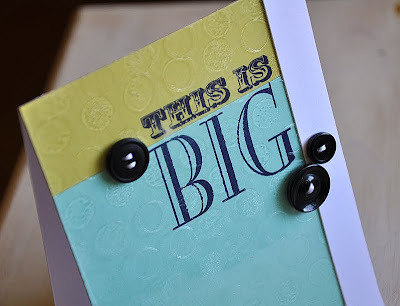 Hope you enjoy the rest of the Blog Hop! Thanks for hopping by!